From the moment we learn to drive, we gain independence, freedom, and control. Driving is linked to our ability to socialize, work, and enjoy our favorite activities. When you’ve been driving for many years, it begins to feel like second nature. However, driving is a skill that depends upon your visual abilities, strength, focus, and coordination. Safe driving also requires the use of your memory, attention span, and comprehension. As we age into our elder years, these skills may decline and begin to affect the way we drive. It is important to recognize these changes in your abilities or in the abilities of an older loved one in your care. If your skills are impaired, you may need to adjust the way you drive to stay safe behind the wheel. Car crash rates per mile driven begin to increase at age 65. These risks become higher during more complex tasks such as making a left turn. Fatality rates are excessively high for drivers over 65. 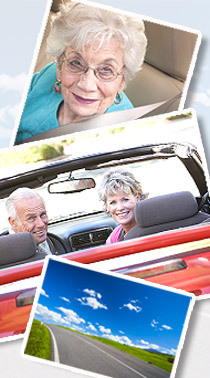 It is projected that by 2020, approximately 40 million (75 percent) of those over 65 will be licensed drivers. It’s important to be honest about any changes in your driving skills. If you are caring for an older driver, it’s important to ensure they are still able to drive safely. Vision impairment, fatigue, or medication can all contribute to poor driving. However, there are some things you can do to keep yourself safer on the road. Adjust the driver’s seat so that your chest is 10 inches or more from the steering wheel. Your eyes should be at least 3 inches higher than the top of the steering wheel, so adjust your posture, your seat, or use a seat cushion to elevate yourself if necessary. Minimize the “blind spot” in the rear of the vehicle by adjusting rear and side view mirrors. If left turns are a problem, plan a route with more right turns, and if possible, minimize your need for left turns. Avoid rush hour by planning an outing during quieter times, like on a weekday afternoon. Avoid driving after dark whenever possible. Avoid driving when it rains, snows, or in other bad weather. Drive in familiar areas and avoid driving long distances. Don’t drive fatigued or while heavily medicated. Stop driving all together if it becomes difficult or if you feel unsafe behind the wheel. Be sure to talk to your physician about your concerns as well. They can help you by ordering appropriate tests and make necessary referrals to specialists to properly evaluate issues that may interfere with driving. Your physician can also make changes to medications, alter treatments, or recommend adaptive equipment and rehabilitation to overcome issues that can make driving unsafe. The Physician’s Guide to Assessing and Counseling Older Drivers suggests a few additional questions you can ask a loved one to help you better assess whether driving is an issue for them. Do you have any problems when you drive? Do you have any problems driving at night, turning the steering wheel, using the foot pedals, or reacting to traffic situations? Do you think you are a safe driver? Have you received any traffic violations or warnings in the past two years? Have you had any near-crashes or crashes in the past two years? Be open and honest when broaching this topic. Communicate clearly about your intentions and be prepared to present some solutions should your loved one need to stop driving. Make it clear that the goal is not to diminish their independence, but rather to keep them and others on the road safe from harm.